With the help of Eli Luna, Alex Flores, and Thomas Branch, A Galaxy Called Dallas will host it's first monthly art night on June 1, 2015, in Garland. The idea was brought to us at Galaxy Dallas by Alex and Eli and we couldn't wait to do it. Basically, you bring paper and pencils, or whatever you want to work with, and we draw for a few hours. The night will have a theme or maybe not, you can help us decide. At the end of the night, we collect your piece and $5 (each if you wish to submit more) and when you return the following month, you will get a copy of our new magazine, Warp 11! No critiquing, no rejection letters, nothing but "published!" 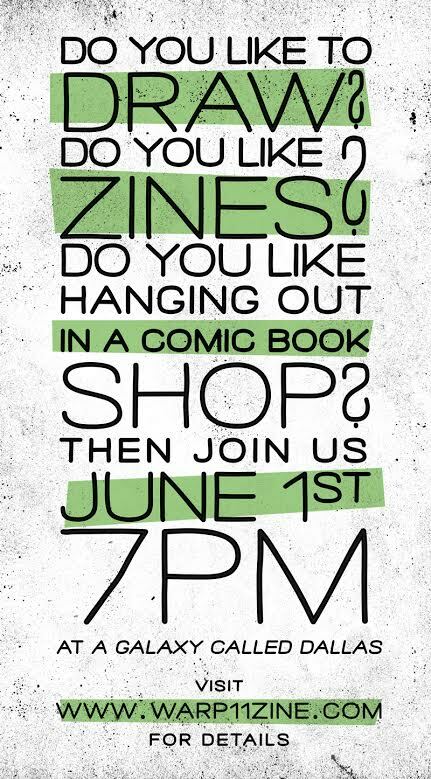 Go to www.Warp11zine.com for more info and join us for some drawing fun Monday night.